“Never trust a slender chef.” That’s one of my two Rules. (The other Rule? “Careful when you’re in a position to trust a man who uses a blow-dryer on his hair.” More on that some other time.) Yet there’s an exception to every rule. And the exception to this one is Brian Stickel, executive chef at Clyde’s of Georgetown. We sat down at a small table in the cozy, wood-lined Back Bar, just off the bright Atrium Dining Room at the tail end of the lunch rush. It had been at least a year since I’d seen Chef Brian – we used to live in the same building – and it would be the first time we’d discuss food. I’d never asked him about cooking before because, really, how many people like to bring their work home with them? In the 15 years that he has been a chef, Stickel has learned how to eat well and eat smart. He focuses on balance and lives the “calories in, calories out” mantra. “It’s my job to taste everything,” he said. “I definitely eat in smaller amounts throughout the day, never three big meals.” In addition to exercising, Stickel maintains a healthy weight by eating healthy, filling food – usually a bowl of cereal with lots of fiber – before he arrives to the Clyde’s kitchen. I was relieved to hear this statement for two reasons. 1) It’s good to know that the pros don’t taste the food and then spit it out, unlike wine tasters (shame on them! ); and 2) I like talking to people who possess common sense. Sometimes, “whatever is growing” is pounds and pounds of the same item, and Stickel’s team needs to figure out what to do with it. For a seasoned pro, the challenge is surmounted, but take heart, readers, it was not always so. From time to time, the Georgetown location will get a huge shipment of produce that must be used since the menu reflects what’s in season. Clyde’s Willow Creek Farm in Loudon County, Virginia, is an actual working farm tended by – you guessed it – a farmer, and when they have the occasional overabundance, they share the ingredients with other restaurants. “They’re able to do more heirloom [tomatoes], herbs, vegetables. I personally will get stuff from time to time,” Stickel said. “We had a garden this year. I grow fresh herbs at home, and I usually bring in bunches of rosemary or other herbs to cook with” since Clyde’s of Georgetown does not yet have its own herb garden. He and Bridges emphasized the lengths that Clyde’s staff go to when preparing a meal for a guest with allergies. “When someone has an allergy [as opposed to a dietary request], I prepare the meal from scratch myself,” Stickel said, his expression serious. Next on the list of health-related topics, we discussed salt. Because of all the hullaballoo regarding heart health and sodium in recent years, it was surprising to hear that few diners come in requesting low-sodium dishes. Stickel noted, “many sauces and parts of dishes are prepared beforehand, but salt can be removed from some dishes. Alternatives to seasoning with salt are spices and acidity. Those can also be used to enhance flavor.” But salt continues to hold the top spot among his favorite flavoring ingredients. 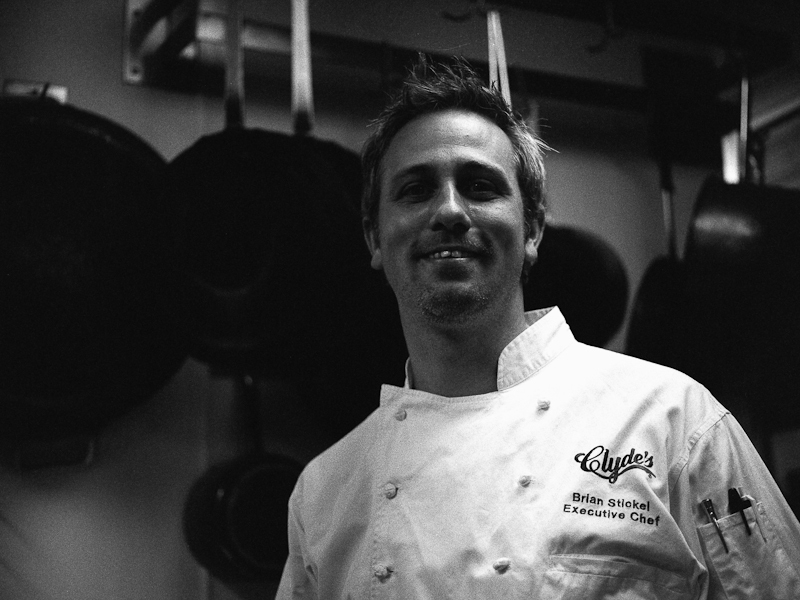 Tune in tomorrow for the exciting conclusion to our interview with Clyde’s of Georgetown Executive Chef Brian Stickel! In the meantime, make Clyde’s famous chili or one of these other tasty recipes! Well done, great first post. I’m looking forward to future articles. Agree – he is handsome! Good post, too. Ask the chef about his famous “steak-um” sandwiches. everyfoodfits.com » My, what fresh ice cream – it’s getting salty with me!